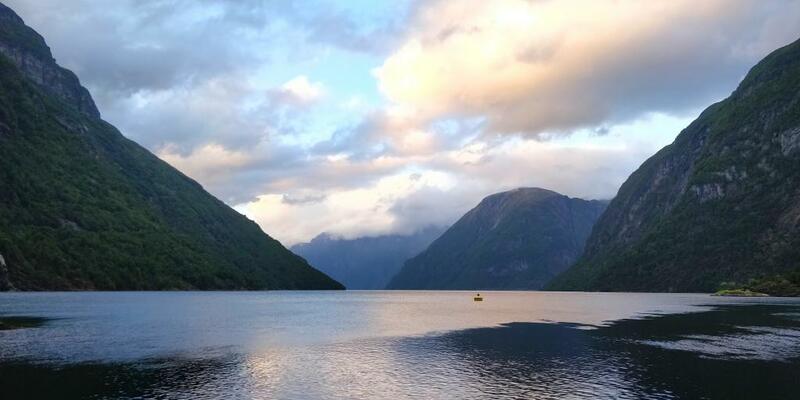 In terms of natural beauty, picture-perfect scenery and majestic landscapes, the fjords of Norway have it all. 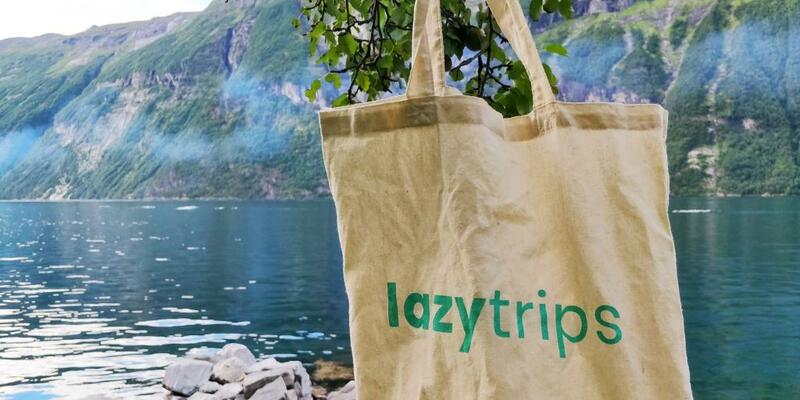 It's no wonder that trips to this part of the world have gained popularity in the past few years as travellers veer away from over-visited destinations in favour of off-the-beaten-track holidays. Cruises are a popular way to see the fjords, and there are lots of ships that do extensive tours all year long. But a more wallet-friendly, more adventurous and all-around more fun alternative is to go on a kayaking excursion. 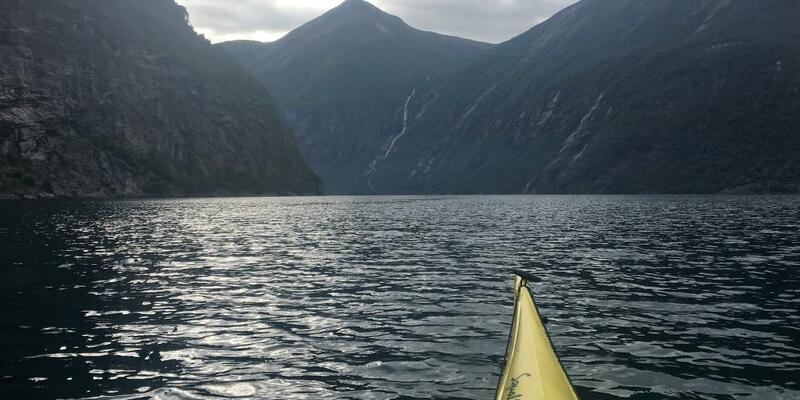 If you're after breathtaking views, wild mountainous terrain and a bit of a workout, I highly recommend a two-day kayaking tour of the fjords. Here's how it's done. We met our tour guides, Tabitha and Becky, at a quay in the tiny village of Hellesylt, where they'd offloaded our kayaks and camping equipment for the trip. After a brief introduction we set about repacking our things into a dry bag: a small triangular sack designed to fit snugly into the front of a kayak.Then we were pushed off into the water to begin our expedition! Lucky for us, the weather was perfect: dry, not too cold, and hardly any wind, which meant the water wasn't choppy and kayaking was pretty much smooth sailing. In fact, the water's surface looked like glass as we rowed our way through it, staring up at the majestic mountains and waterfalls all around us. One thing we noticed immediately was a low rumbling noise rising above the tranquil silence of the fjords. This, we learned, was the sound of hundreds of waterfalls cascading down craggy mountains from the glaciers up high and into the water below. It's a sound I won't ever forget. Our first stop was an abandoned farm about 5km out from Hellesylt town. 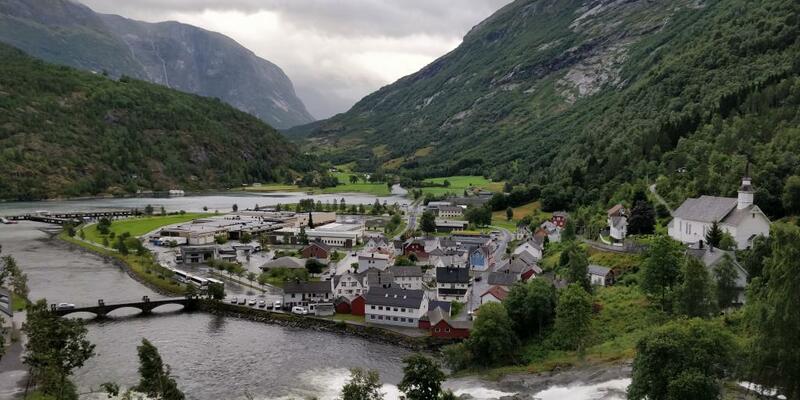 These long-forgotten fjord farms, many of which are perched precariously up high on rock shelves, are part of Norway's living cultural history and can be found all over Geirangerfjord and other areas. A lot of the farms were abandoned in the early 1900s as farmers sought an easier, less dangerous way of life. These days, some are maintained by volunteers and a good proportion serve as camping grounds for fjord explorers like ourselves. We beached our kayaks and unpacked our things, bringing them up to an old dock that was to serve as our dinner table. Then we set about pitching our tent as the tour guides brought out cold cut meats, bread, cheese and berries for lunch. 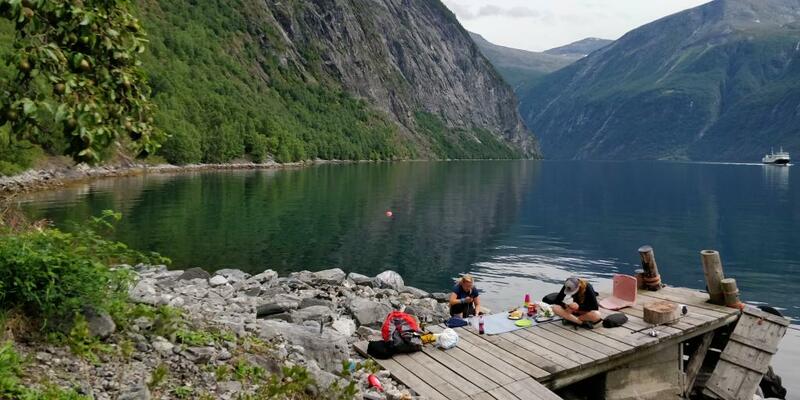 After fuelling up, we rinsed our plates and cutlery in the fjord and put on our bathing suits. It took some time to get up the courage (and to find a path around the little jellyfish populating the shoreline) but we finally plunged into the unbelievably clear water... for about 15 seconds. That was all we could take of the shockingly cold water, which was probably about 14 degrees Celsius. Clambering back on shore, we dried off and put on some warm clothes for the evening. Then we wandered around the campground looking for twigs and sticks to add to the bonfire. As the sky began to darken a little, we took turns cooking our dinner and fishing off of the dock. 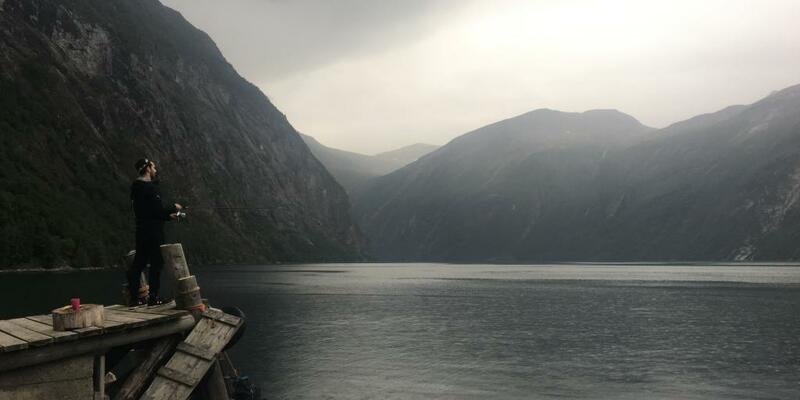 Several big boats and cruise ships passed by, their passengers waving at us from the top deck, and we thought how lucky we were to be experiencing the fjords in an authentic way, up close and personal, rather than on a boat and from a distance. For dinner, our tour guides prepared a delicious chicken and rice dish with vegetables, followed by everyone's favourite camping treat: s'mores. We each perched on a rock and ate hungrily, sipping hot tea from plastic cups and marvelling at the glassy water. As we cleared our plates and began packing the leftovers away, it started to drizzle. It was the very first sign of rain all day, and as the raindrops hit the outside of our tents it provided the perfect faint pitter-patter that sent us straight to sleep. In the morning, we woke early to the sound of that same white noise of the roaring waterfalls. 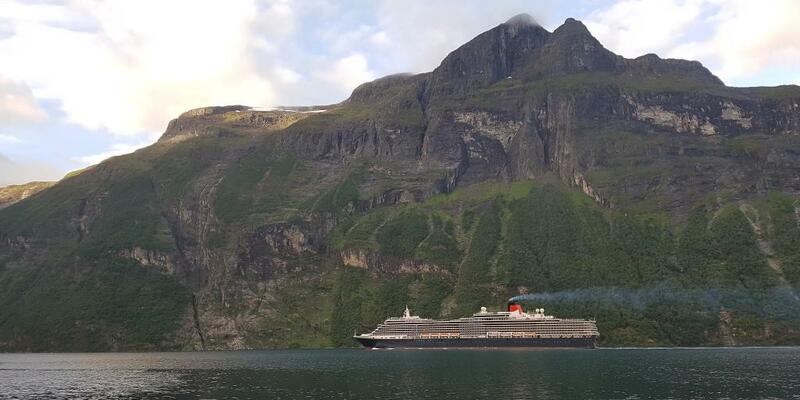 As we opened the front of our tent, the first thing we saw was the 294-metre-long Queen Victoria cruise shop sailing by, looking positively miniature against the gargantuan Norwegian mountains in the background. After a quick breakfast of bread, leftover berries and peanut butter, we took down our tents and began repacking our things into the dry bags. It was considerably sunnier than the day before, so I was glad I'd brought a baseball cap to protect my face from the sun's rays. 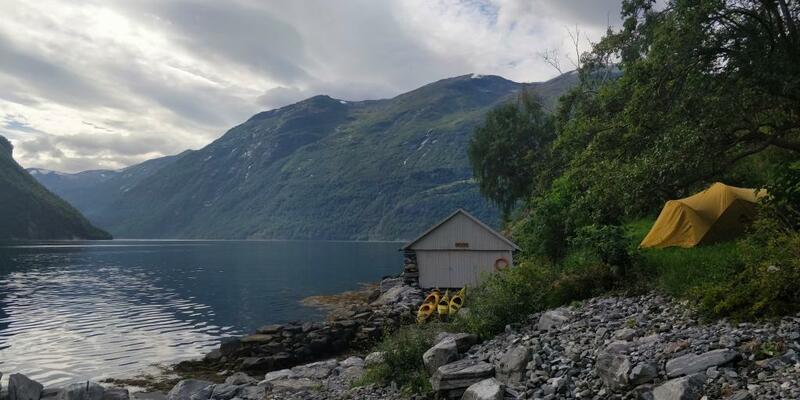 We bade farewell to the abandoned farm and set sail once more, this time heading east towards the village of Geiranger, at the head of Geirangerfjord. Our destination of the day was Seven Sisters: a famous waterfall consisting of seven separate streams cascading like silver ribbons into the fjord. 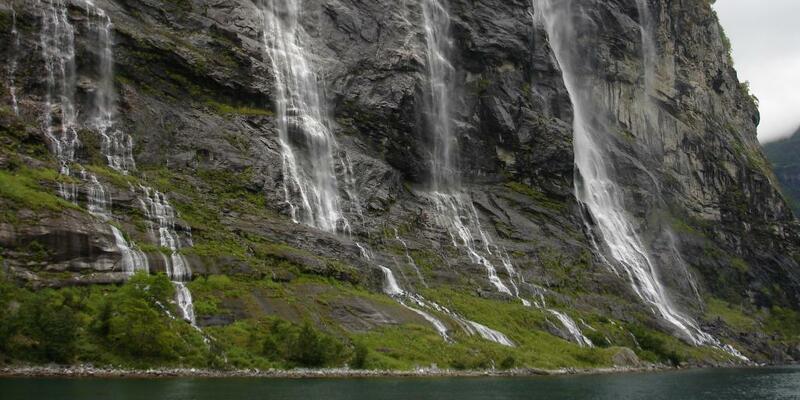 At 250 metres tall, Seven Sisters is the 39th tallest waterfall in Norway (which says a lot, considering the fact that Norway is considered the land of waterfalls!) It's one of the most frequently photographed waterfalls in the area, and it truly is a sight to behold. 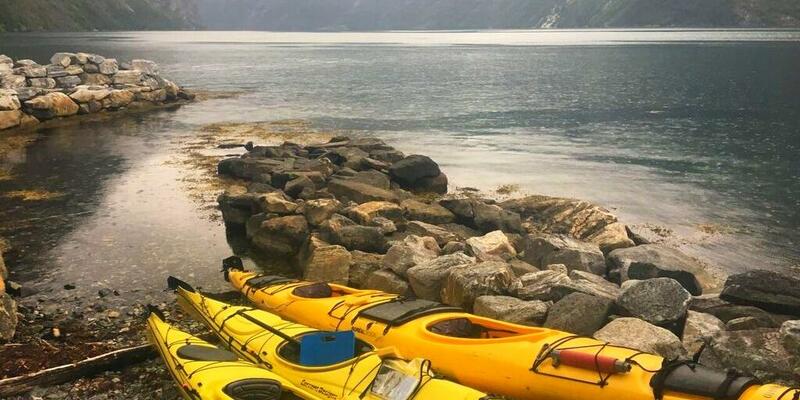 We admired the Seven Sisters from our kayaks, staying on the right side of the fjord in order to avoid boat traffic and the ferry carrying passengers from Hellesylt to Geiranger. Rock falls are known to happen around here, so we made sure we were a safe distance away from the mountains at all times. Just opposite Seven Sisters is another waterfall called the Suitor ("Friaren" in Norwegian). Legend has it that the Seven Sisters dance playfully down the mountain, while just across the fjord, the Suitor flirts with them from afar. After staring up at the incredibly powerful waterfalls for quite some time, we finally turned our boats around and began making our way back towards Hellesylt. The wind was starting to pick up, but it wasn't too difficult to kayak back to another abandoned farm for lunch, this one on the opposite side of the fjord from our camping ground. We parked our kayaks in the dock and got out to stretch our legs and prepare some sandwiches for lunch. One thing we learned about the Norwegian diet is that it's heavy in salami and cheese - especially a particular brand of cheese called Synnøve Gulost, which is absolutely delicious! Dessert was a Kvikk Lunsj (pronounced and translated as "quick lunch"), Norway's version of the Kit Kat. Our luck finally ran out and the weather turned - just in time for the last part of our journey. It took us nearly three hours to kayak the remaining distance back to town, and by the end of the trip the skin between my thumb and forefinger had been rubbed sore from paddling. 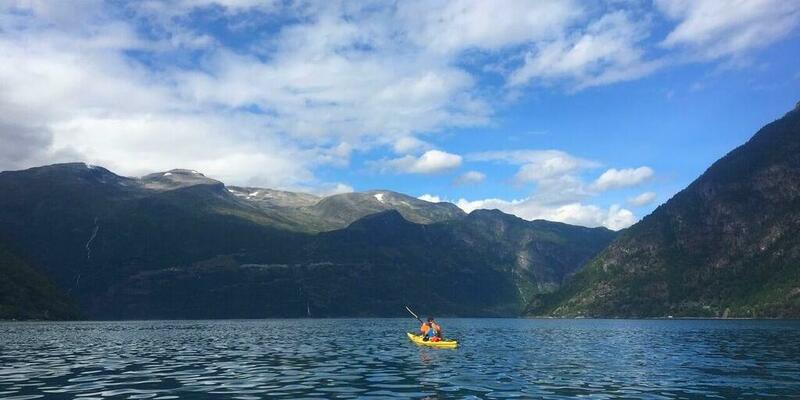 But nothing can compare to the feeling of accomplishment when we docked our boats and stepped off onto dry land in Hellesylt, knowing that we had kayaked 20km in total and that we'd fully immersed ourselves in the famous Norwegian fjords. Hellesylt, the starting point of our trip, is a small village just south of Alesund (also spelled Aalesund). It's only about 40km from Aalesund city centre as the crow flies, but thanks to the winding roads and fjord-divided towns the bus ride takes about 2 and a half hours. To get there, fly into Alesund Airport Vigra and hop on a bus to the city centre. There are a couple of buses that will take you there, and if you ask the information desk they'll point you to the right ones. We took the one that was headed to Moa and we got off at Aalesund bus station. Time of year: We went in the beginning of August, which is prime time for good weather. 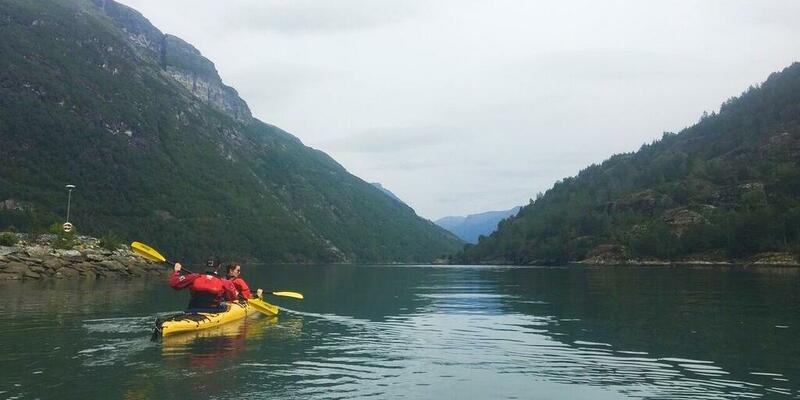 Tour guide: We used and would highly recommend the tour company Norway AdvenTURes. Fitness level: We didn't do any training in the lead-up to the trip and have we minimal kayaking experience. It was challenging at times but 100% manageable. 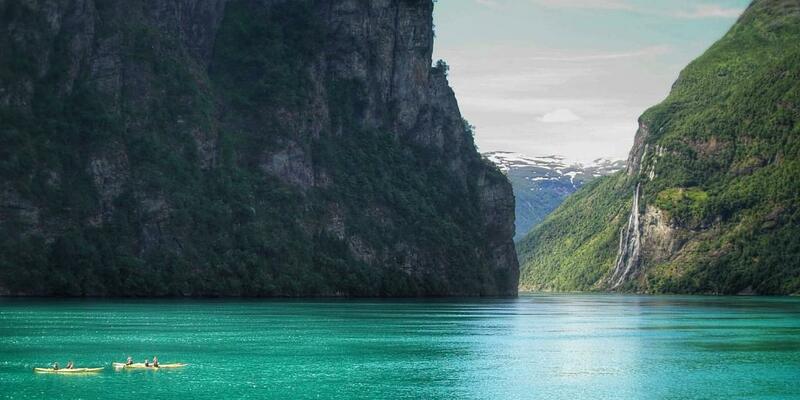 A fjord is a long, deep and narrow inlet of the sea between high cliffs, often set in a U-shaped valley. It's formed when a glacier retreats and the resulting valley floor is filled with water from a nearby ocean or sea. What are the camping rules in Norway? Norway has some of the most liberal public access and camping laws in the world; people here are allowed to pitch a tent and camp pretty much anywhere they want for up to 48 hours - including privately owned land. This means technically you could set up camp in someone's backyard and so long as you're 150m from their house and don't damage anything, they can't tell you to leave. Yes, it is. But if you plan your trip accordingly, you can avoid spending too much money. For one, kayaking is a much cheaper alternative to taking a cruise (our 2-day tour above set us back about £260 per person, and that included meals, accommodation and countless priceless memories!) so it's an easy way to keep the budget low. We also found that public transport and ferries were efficient and reasonably priced. Two things that do tend to be pricey are food and drink. Plus, alcohol is notoriously difficult to buy, with many alcohol shops closing early on weekdays and all day on Sundays. You can get around this obstacle by purchasing a bottle at the airport in duty-free and carting it around with you on your adventure.